Three words: Who am I? These words play on a continuous loop as the background track in the life of a middle school student. Perceived answers to that question come from all different directions: school, social media, movies, relationships, entertainment, and other activities. As Christ Community Church's Student Ministry, we believe the answer to the question, “Who am I?” can only be found in knowing Whose you are: a beloved child of the God who created you and is crazy about you. As students begin to discover that their identity is found in Jesus and they make decisions to trust in Him, we celebrate that! We also realize that such a big decision is always a culmination of scores of small decisions along the way. For many students at CCC, the first and most critical decisions are made by their parents. When a parent makes a decision to introduce their kids to Jesus at an early age and get them plugged into the church community, the chance of that student knowing Jesus dramatically increases. For Annie and Sophie DelSenno, their journey to knowing Jesus began at an early age. A mom and dad who made church a priority and brothers who modeled their faith led the sisters to place their faith in Jesus. As the girls became more familiar with the Bible in elementary school, they began to understand the relationship that Jesus was inviting them into. Sophie shared, “I have known about Jesus and God all my life, and from an early age I would go to Sunday school and learn Bible stories. I knew that Jesus died on the cross and rose again.” In addition to the weekly church programming, special church events can also impact how a student understands the gospel. 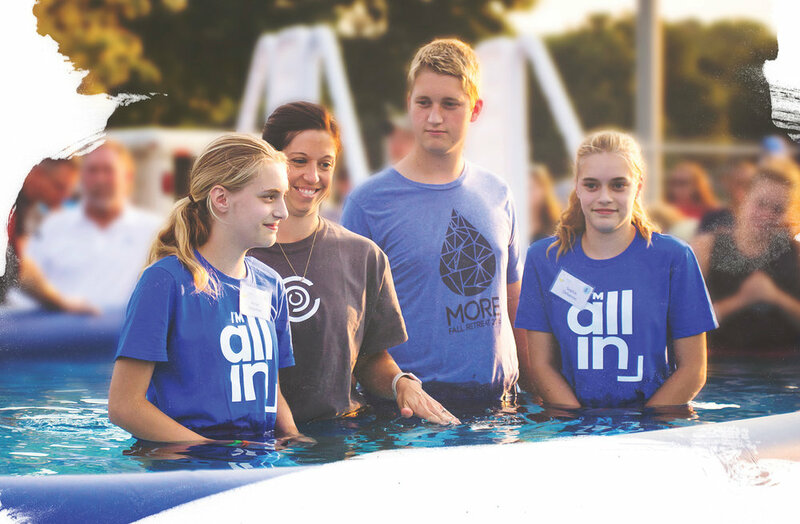 “At Summer U, I realized that a relationship with God is life-changing, and it was. That happened when I was in third grade. When I was about ten or eleven, I began to own my faith and take it seriously,” shared Sophie. As students begin to own their faith and make decisions to place their trust in Jesus, we challenge them to take steps of going public with their new identity. One of those first steps is to follow the model of Jesus through public baptism. Seeing students make a courageous public statement about their identity in Christ is always incredible. Going public together with this new identity was a great experience for Annie and Sophie, who are identical twins. Annie said, “Getting baptized with Sophie was special because it was a special moment in our walk of faith. I got to be baptized with my twin sister and best friend by my side.” The girls were able to choose who baptized them—their older brother Josh and their Journey Group leader Erin. “I requested my brother Josh because he has been a huge role model to me and I look up to him so much, as well as my journey group leader Erin. I look up to them both—they have helped me grow closer to Jesus,” Sophie stated. As the background track continues to loop, both girls are continuing to discover that the answer to the question, “Who am I?” can only be found by knowing Whose you are. Alex Ehly is the Middle School Pastor at Christ Community Church.